QR-code of this contact website. 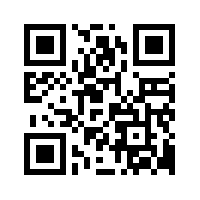 Scan this to remember and save this web address. Click here to get my contact card (enter as username and password both the first 4 letters of this site). For my e-mail just add .net to the end of the email address ulno@ulno or remove from the email address zulno@ulnoy.next z, y, and x. If you do not trust email as a communication medium and want to contact me securely as well as privately, please send me a message with the program bitmessage to BM-NBtj5VF1i1QvF8D7JKXpKo59S46U4qsZ. my key for emails ending with ulno.net. ID: 0x5F805880. Fingerprint: E736 0689 412B 9DD0 FFAF 1D55 A335 50B2 F012 E569. My CV has its own page.